TORONTO — Anthony Calvillo has a new gig. 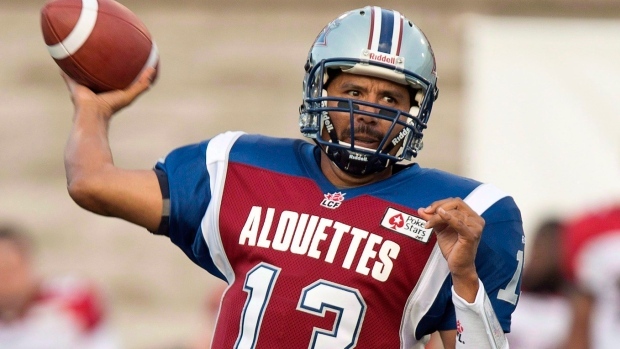 The Toronto Argonauts announced Monday pro football's all-time passing leader will serve as their quarterback coach in 2018. Calvillo spent the last three seasons with the Montreal Alouettes as their receivers coach, offensive co-ordinator and quarterback coach. Calvillo is now reunited with Toronto head coach Marc Trestman. The quarterback played five seasons for Trestman in Montreal (2008-12) and the two won two Grey Cups (2009-2010) together. With the departure of Marcus Brady to the NFL's Indianapolis Colts, receivers coach Tommy Condell will also handle the offensive co-ordinator's job. Linebackers coach Mike Archer takes over as defensive co-ordinator from Corey Chamblin (leave of absence) while Tyron Brackenridge handles defensive backs after splitting the job with Chamblin last year. Greg Quick begins his second stint as Toronto's linebackers coach, holding that post previously from 2010 to 2011. The remainder of Trestman's staff consists of: Kevin Eiben (special teams); Josh Moore (running backs); Jonathan Himebauch (offensive line); Justin Poindexter (offensive quality control); Kerry Locklin (defensive line); Gavin Lake (defensive quality control); Wendell Avery (special-teams assistant); and J. Aggabao (strength and conditioning).